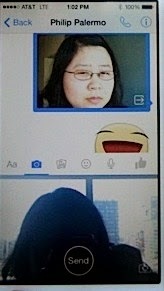 You can now send videos, voice notes and pictures with the new facebook messenger for iOS devices. The new updated facebook messenger for iOS now includes some added options below the box where you type in your message. These options includes sending a voice note, a picture or video. According to Engadget, this new update is actually coming few weeks after Facebook announced having the facebook messenger as a stand alone application and no longer incorporated into the primary facebook application. This is really going to make chatting on facebook a lot fun with the addition of cute stickers to make your conversations even more interesting.. Moreover, the application has got a little issue with the way you can send your voice notes, pictures and videos. That is because, there's no room to preview before sending, you just have to put in all your efforts to make your first attempt is the best :). This is actually a thumbs down for this new update in that regard because compared to popular chat applications like whatsapp, you are allowed to preview your voice notes before sending them. But all the same, this is a cool development from facebook and we'll be waiting to have it on Android devices as soon as possible too.